The Wall Street Journal told us to expect a Samsung Galaxy S7 launch to happen in March 2016, and considering their information is rarely incorrect we’d say it was worth believing. But if you aren’t as trusting, maybe word from one of the carriers who will sell this thing will make you a believer. 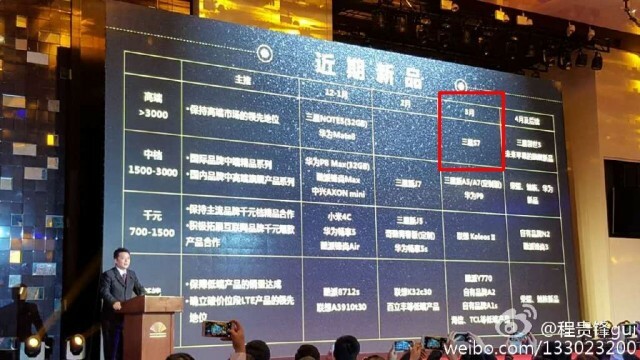 China Mobile recently held a presentation showing their launch plans for the earlier parts of 2016. Alongside a hodgepodge of devices planned from local talent, Samsung’s Galaxy S7 had a spot of its own on the March column of the presentation slide. This would appear to line up with earlier rumors of a February announcement, as Samsung typically doesn’t like to wait longer than a month before delivering announced flagships. There weren’t any other details to be had from China Mobile, but let’s recap what we know about the device. It’ll look like the Samsung Galaxy S6 in terms of design. It’s likely to use Qualcomm’s Snapdragon 820 and their in-house Exynos 8890, depending on region. Samsung is said to be using a pressure sensitive display. There will be no microSD slot or removable battery, just like last year’s models. It will have USB Type-C. There will be 4 different modes: S7, S7 Edge, S7 Edge Plus, S7 Plus, with the main difference being in size. We’ll have to await more concrete details to make their way through the rumor mill before knowing exactly what’s in store, but one thing we’re sure about is that the Samsung Galaxy S7 — like all previous devices in the lineup — will look to push the bar for high-end flagship devices in more ways than one.